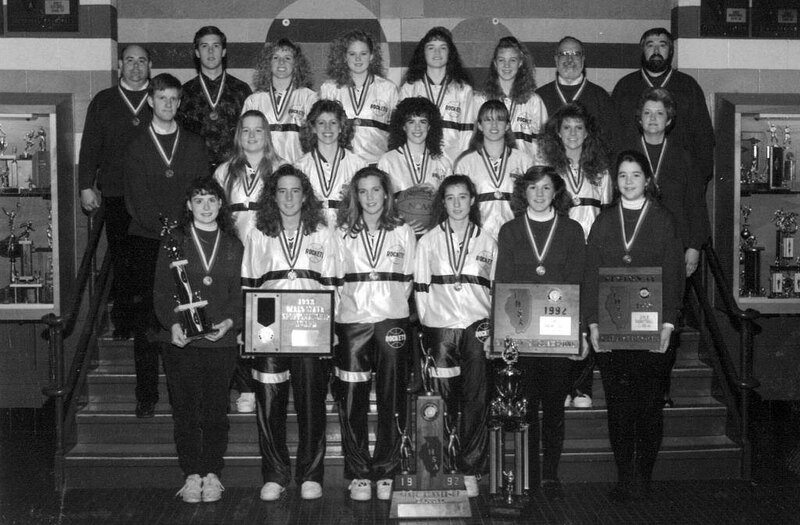 The Limestone girls swept through the 1992 regular season with a 26-0 record. The team was Mid-Illini Conference champs, Limestone Tournament champs, and Dixon Tournament champs. The girls advanced to the title game with wins over Bloomington (68-54 in the super sectional), Buffalo Grove (74-47 in the quarterfinals) and La- Grange Lyons (52-50 in overtime in the semifinals). The only loss came in the championship game against Chicago Marshall 48-46. The girls set several records, especially in 3 point shooting at the state tournament. Tammy Van Oppen was chosen Ms. Basketball for the season. Jenny Koeppel, Tammy Van Oppen and Jamie Broadstone all went on to play Division 1 basketball. Rounding out the starting lineup was Wendy Reeves and Melissa Shryock. Coached by John Gross, the Limestone girls were noted for their trademark tenacious defense.